Want an action packed summer? Then summer camp’s for you! No two days are ever the same, which is why it's so great! So get ready for an action packed summer! No two days at camp are ever the same, which is what makes it so great! Working as a Counsellor means you'll be involved with pretty much everything that happens on camp - so get ready for an action packed summer! 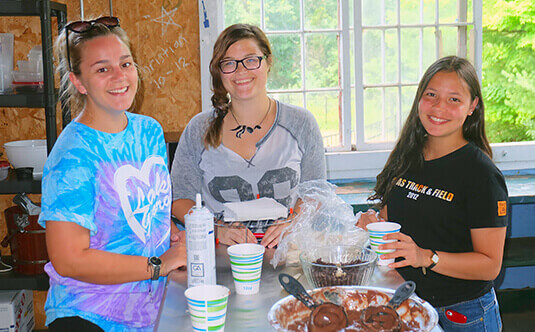 What is a typical day like for a Camp Counsellor? Although every camp is different, most camps have similarities in how they run on a daily basis. So use this as a guide to help you imagine what to expect from a day on camp! 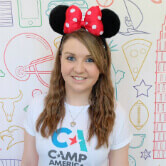 Each day there are going to be lots of activities going on all over camp. Activity sessions will normally run for an hour and campers will move from one to the next. If you're hired by a camp to teach a particular activity, you will normally stay in your area to teach that activity to different groups throughout the day. General Counsellors will move around with the campers and help them get involved in each activity. So from the Waterfront, Sports Pitches, Theatre, Pool, Stables, there's always something happening anywhere you look! Meal times are a lot of fun at camp as well as being pretty hectic. Counsellors will sit at the tables with the campers and will be responsible for collecting/serving the food. Don't be surprised for spontaneous songs, chants and games to break out in the dining hall! It's also a time when announcements or special mentions will get made, while the whole camp is in one place. There are 3 meals served each day on camp and the great thing is - you don't have to cook them! Depending on how your camp schedule works, you're likely to get some time off during the day. This may be a specific activity block or just a set time period throughout the day. You'll often work on a rotational system so there's always some Counsellors with the campers. On your time off you can often get involved in some of the activities on offer or just have a lie down and try catch up on some rest! After dinner there will be an evening activity that will involve the whole camp or large groups of the campers together i.e. boys and girls. This will be a slightly different activity that isn't on the regular schedule and will give you the chance to get involved in something different and be with the other campers and Counsellors that you haven't been working with throughout the day. 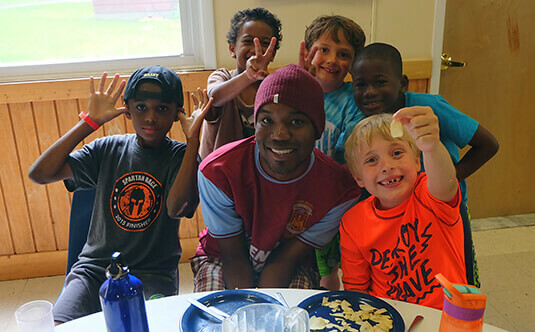 Evening activity can include things like; camp fires, dances, all-camp swim, pool parties, treasure hunts, theatre performances plus any creative ideas that the staff have to keep the camp entertained! Here's What Your Day Might Look Like! Yeah that time is right and before you say it’s nothing to do with the time difference… this is probably the typical time you’ll wake up, if you’re not already awake! Now that you’re awake (kind of) it’s time to get the campers up! If you’ve got the youngest campers in your cabin you might find that they’ve already woken you up but either way the day starts now! Once you’re all awake it’s time to make you’re way up to the dining hall for the most important meal of the day. Make sure you get a good meal inside you ready for all the energy you’ll be burning throughout the day. Breakfast is done, you’ve been back to the cabins to brush teeth, do a quick tidy and now you’re ready for the activities. An action packed morning awaits, make sure all the campers know where they’re going and have everything they need and off you go! Where has the morning gone? Don’t worry time for a sit down to refuel and good news… it’s Taco day! Catch up with the campers and other Counsellors and about your morning’s activities. If you’re luck your camp will have a rest period right after lunch! This gives everyone the chance to get out of the sun for a while and chill-out for going back out and doing it all again. We’re back! Another action packed period of the day with back to back activities all over camp. We’re finished with the regular schedule now and ready for an all-camp activity. Tonight is the Hawaiian themed dance! Get back to your cabins, dig out the Hawaiian shirts, shorts, flip flops and get ready to dance to every classic children’s pop song you can think of! Evening Activity is done, time to get the campers (and yourself) back to the cabins and ready for bed. Make sure you follow your in-depth shower and teeth brushing schedule so everyone is done and in bed on time! The moment you’ve probably been waiting for, for a while now! Lights out for the campers to make sure they get a good night’s sleep ready to do it all over again tomorrow. "Even though your day can be hectic and you could do with catching up on sleep, you have so much fun that you forget how tired you are. There's always something going on and with all the activities you going to and from, the day just flies by without you even knowing!"